Dissatisfaction of customer because of human error in reading consumption and low accuracy of existing mechanical water meters. Inability to detect the leak. Low accuracy of reading water flow due to air. Man power required to manually record old meters readings. Inability to calculate exact demand and consumption. Supply high accuracy with Class- D type of meters. Increase billed water. Reduce non-revenue water. Reduce Manpower required for water reading. Achieve automatic reading up to GDOW building with high accuracy. Issue monthly automatic billing form system without human interfering. Immediate investigate of reading any time in case of customer claims. 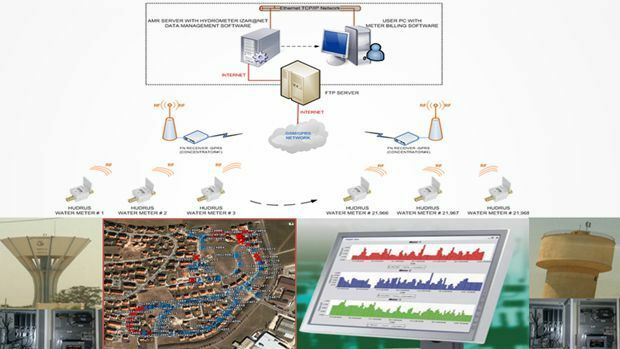 System Design of AMR system using fixed network with GPRS concentrator. Replacement of 13,400 existing mechanical meters with ultrasonic meters with high accuracy inside GRP boxes with all fighting’s and accessories. Design and install fixed network GPRS receivers with Solar panels. Design and install FTP server and redundant application servers for automatic readings. Interface AMR system to billing system for automatic billing. Testing communication with all meters and assuring getting the reading for all meters every 2 hrs with 95% of total Nos. of meters. Installing Ultrasonic meters class-D type with built-in radios 434Mhz. Automatic reading using GPRS Receivers “ RDC” and sending readings to FTP server every 1 hr. Interface between Meter reading database and billing system. Achieving 95% of water reading automatically without any failure. System stability and high capacity if battery stands for 12 years. Low cost of Maintenance as the system maintenance free. Customer satisfaction for accuracy bills and remote monitoring. Free maintenance and monitoring of all alarms of meters with customer details “Reverse flow, leakage, no usage, battery life …etc”. Water meter with boxes and fighting’s : 13,400 Nos. GPRS Receiver with Antenna : 24 Nos. Solar panels : 9 Nos. FTP & Application Servers : 3 Nos. IZAR@NET AMR Software license : 50,000 Meters. Provided accurate database of consumers details and long term archiving of readings. Using Google Earth for monitoring of status readings, spotting customer locations co-ordinates and alarms “ if any”. Automatic readings every 1hr of meters and monthly billing. Getting alerts for all meter readings in case of any. Increase revenue due to accurate billing. Reduced water leakages due to proper monitoring and fast maintenance. Control the consumption of water for Dammam & Khobar city based on demand.